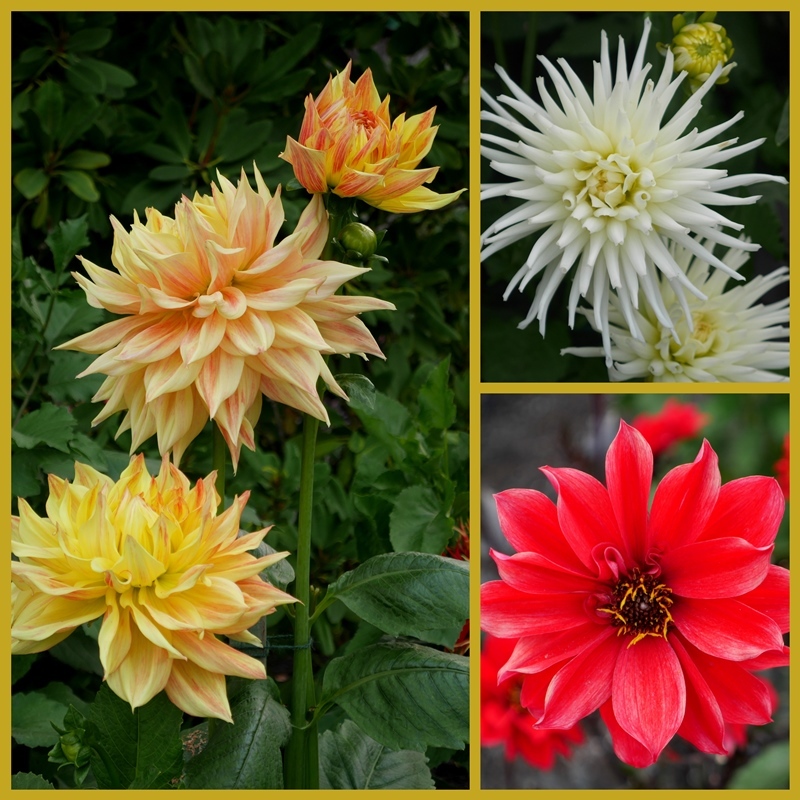 Dahlias might not be blooming in my garden yet, but they are beautiful in Butchart Gardens. We visited there this weekend with my parents who came over from the mainland for the weekend. The fountain danced. Watching the water wave back and forth almost made me sway in unison. The sky was covered with high smoke that obscured direct sunlight and cooled the temperature dramatically. Zinnias are so cheerful. Rows of them stood, stalwart and colorful in a wide border. My parents. Saturday was my mother's 82nd birthday. We brought a picnic to the gardens, and enjoyed it at one of the tables provided, then wandered through the flower gardens before settling ourselves down on the sloping lawn for a view of the weekly summer fireworks show. Music, humour, a story here and there, and plenty of booms and sparkles marked the 30 minute spectacle. A fun way to celebrate a special day with my mom and dad. I am so thankful to God for my parents and for their presence and guidance in my life. For Sunday lunch the celebration continued with two of her grandchildren and their families (our son and one of our daughters), along with three of her 17 great-grandchildren. Yours truly is in the background. Dinner outside, under another dull smoke-filled sky, was fun and festive. Mom loves lemon flavour, so I baked a lemon cheesecake. There's a tart lemon glaze under the raspberries, plenty of whipped cream, and candied lemon slices to decorate it. Everyone seemed to enjoy it. Your parents look really fit and well - what a lovely way to celebrate your mother's birthday - sadly I lost my mother when she was 62 years old, and have always felt she missed out on so much of what life has to offer regarding grandchildren, and great grandchildren etc. Fabulous lemon cheesecake, it looks delicious and very professional too. What a special weekend that was and what a wonderful way to celebrate being together, my goodness but you look like your Mom! The cheesecake looks absolutely fabulous and your grandchildren are so grown up now, I remember when each of them was born! Nice to meet you on MAGIC MONDAY... Great captures. You honored your beautiful mother well! You look a great deal like her. That cheesecake looks absolutely amazing. What a lovely celebration. Your cheesecake looks fit for a magazine cover, so deliciously professional. I can't think of a nicer way to celebrate one's birthday. Being surrounded by a loving family and all of the beauty at the Butchart Gardens, then end the celebration with that amazing cake. Wow, what a special day for your dear mom. That is a lovely picture of your parents. What a beautiful place to celebrate. Your cake looks amazing! Happy Birthday to your birthday to your beautiful mother! What happy smiles...all around! LOVE that beautiful cheesecake! WOW! It's too pretty to eat! What a lovely celebration and a stunning place to celebrate. The cake looks delicious. I too am thankful for my parents who are such a blessing to my life. Belated birthday greetings to your mother from me. Your parents look great and you favor your mother! So glad for her that so many were able to be there to celebrate with her! A glorious celebration, from the bright flowers to the popping fireworks to the professional-looking cheesecake. Your Mom was well-honored. From the photo, your parents appear to be fit - a sign of good genes! Thanks for giving us a glimpse into your loving family. Beautiful shades of color in the flowers you show. And beautiful cake and beautiful mom, looking so fit and healthy. Something to be thankful for. You favor your mom! Happy Birthday blessings to you Mom, the cake looks so scrumptious,. Dahlias and zinnias are two of my favorite flowers, these are beautiful. Looks like it was a wonderful weekend, thanks for sharing. Happy Belated Birthday to your mom! I can see the resemblance between the two of you. Your lemon birthday cake look delicious. Lorrie, your parents are adorable! Happy belated birthday to your mom! What a beautiful day you shared in the gardens and party with the grandchildren. Your cheesecake looks perfect. Yum! How LOVELY your parents look. Healthy and sweet. I want their lemon cake! Lorrie that cheesecake looks good enough to eat. What a special weekend you had with your beautiful mom. that cheesecake looks delicious...and so pretty. Such a blessing to have parents to love and honor. That cake is gorgeous, Lorrie! How nice that so many of you could gather to celebrate your mom! Happy Birthday to your Mother! The lemon cheesecake is too pretty to eat! Butchart Gardens are on my "to do" list. Loved seeing the dahlias... a flower I just don't seem to be able to grow here in the tropics. Have a grand week! Have to agree with everyone Lorrie - that is one amazing looking cheesecake - you are definitely a proficient baker and, knowing you, it tasted awesome as well!!!!! Your parents look beautiful - I know they are special in so many ways and I hope they will be back at Butchart Gdns. with you often - it's incredibly gorgeous there. We won't have time to visit this upcoming trip however having been before I know exactly how special it is. Your china is so pretty on the table and even the cute kids look speechless regarding your cheesecake. Yum!!!! BTW - I made Rosemary's caramelized onion, fig and blue cheese tart yesterday - which I believe she originally got from you! It was awesome - I don't have many figs this year but there were enough for this tart for supper along with a nice salad. Happy 82 birthday to your Mother! She and your Father look healthy, vibrant and happy--God bless them. Your cheesecake looks amazing, Did you make those candied lemon slices? I'd love a tutorial on how to make them. Butchart Gardens remains on my list of places I'd like to visit one day. It seems to be beautiful in every season. What a wonderful way to spend your Mom's 82nd birthday, at Butchart Gardens!! Wow, Lorrie!! Your lemon cheesecake looks professionally made, but I'm sure was more delicious than a bakery could do. I am so impressed with the beauty of it, and then the raspberries made my heart sigh because they're my favorite. God's blessing to your parents for being in you life. I'm sure your mom felt so very loved...what a fabulous celebration! How wonderful that you was able to spend time with your parents...what I'd give to be able to do that. That raspberry dessert looks like something right out of a magazine and I'm pretty sure it tasted just as good as it looked. HUGS! What a wonderful celebration! Your mum looks great and your cake...mmmmm! Lovely to see the family photographs. I love cheesecake and yours looks scrumptious!